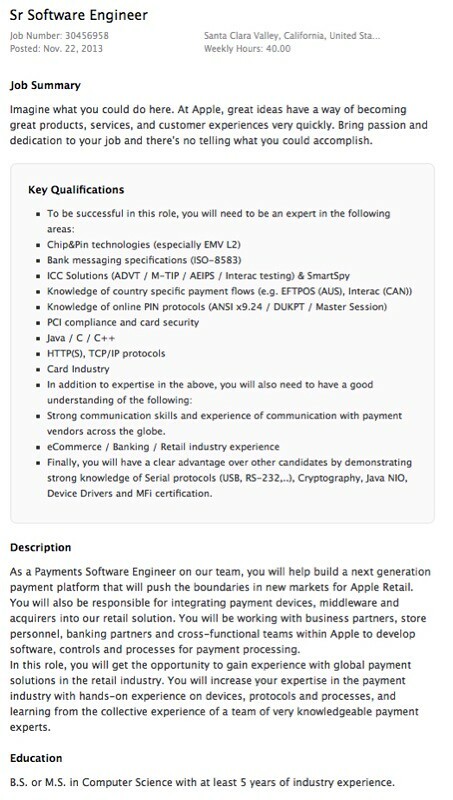 Apple is seeking a Payments Software Engineer to help build a 'next generation payment platform', according to a job posting on jobs.apple.com. As a Payments Software Engineer on our team, you will help build a next generation payment platform that will push the boundaries in new markets for Apple Retail. You will also be responsible for integrating payment devices, middleware and acquirers into our retail solution. You will be working with business partners, store personnel, banking partners and cross-functional teams within Apple to develop software, controls and processes for payment processing. In this role, you will get the opportunity to gain experience with global payment solutions in the retail industry. You will increase your expertise in the payment industry with hands-on experience on devices, protocols and processes, and learning from the collective experience of a team of very knowledgeable payment experts. The posting follows reports that is planning to equip its retail stores with iBeacons to offer an improved customer experience. A new payment platform that utilizes iBeacons for Apple Retail could be launching point for a payment processing system that rivals Square or PayPal. Such a system has been rumored for quite some time; however, Apple does appear to be inching towards it.